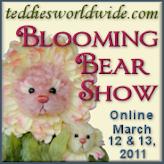 The next Teddies Worldwide show is coming up July 15-17 but the preview starts this Friday July 1st at 4pm New York time and wait 'til you see the preview photos!!!! The theme is "Bears on Parade" and these 75 artits have come up with some very original, fun and creative ideas to portray that theme! During the preview all visitors will have the opportunity to vote for their favorite bear in tw categories... Miniature Bears and Full Size Bears. The winners in each category will be announced at the start of the show! Be sure to visit http://www.teddiesworldwide.com/ to vote starting this Friday! New Year... New Shows & Workshops! I'm organizing two exciting events this spring! 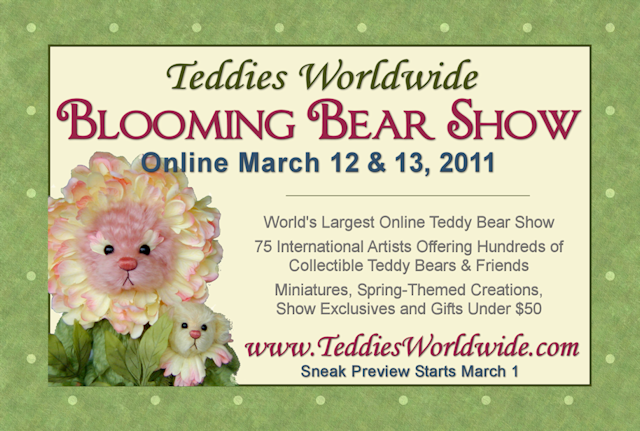 The first is an online show so no matter where in the world you live you can come visit and have a teddy fix! Many award-winning artists will be participating as well as some new bear makers! Click HERE to see the complete list of participating artists! 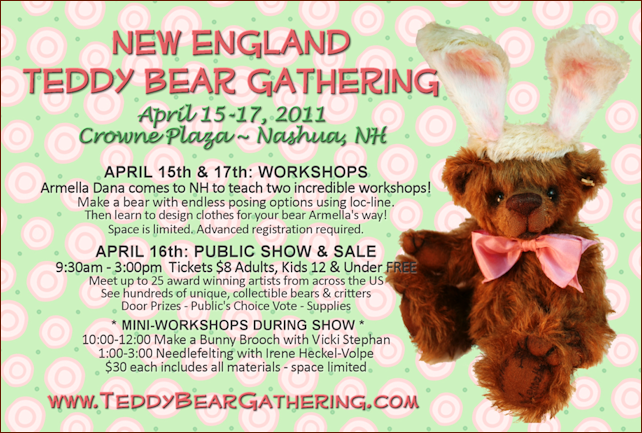 Then in April I'll be hosting the 2nd annual New England Teddy Bear Gathering. 3 days of workshops, a public show and plenty of opportunity to meet or catch up with your favorite artists and collectors. Artists: There are still tables available! Click HERE for an application! Only 4 Months this time! Does anyone even READ this blog? Do you bother ever checking in? Did you take me off your reader cause there's never anything new anyway? I wouldn't blame you if you did! Those of you who know me likely follow me on Facebook anyway! So it's September 1st. Another summer over and I'm not really sure what I did all summer! 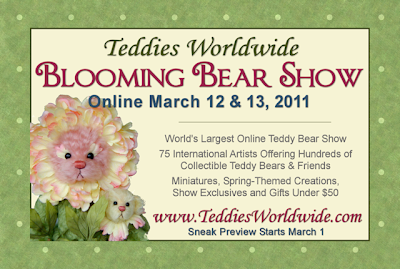 I spent the majority of it sewing and preparing for the Teddy Bear Artist Invitational in Binghamton, NY. We visited an alpaca farm while there. They are such interesting creatures. We got right in the pen with the mommas and their babies. The show itself was a lot of fun. It's always great to see my collectors!! 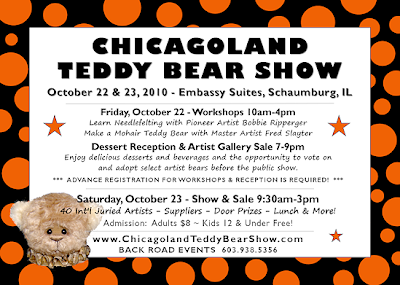 Now I'm working on plans for the Chicagoland Show which I put on in October. Lots of great things will be happening and the artist line up is amazing and new names are being added daily! You can check out the exhibitor list on the website if you're interested. So, you know I'm alive, where I've been and where I'll be until a few more months pass and you hear from me again! LOL! I hope you are well and have great plans for fall... or spring... depending upon where on earth you live! And if you're ever on Facebook look me up! You can find me under Back Road Bears or by my name! 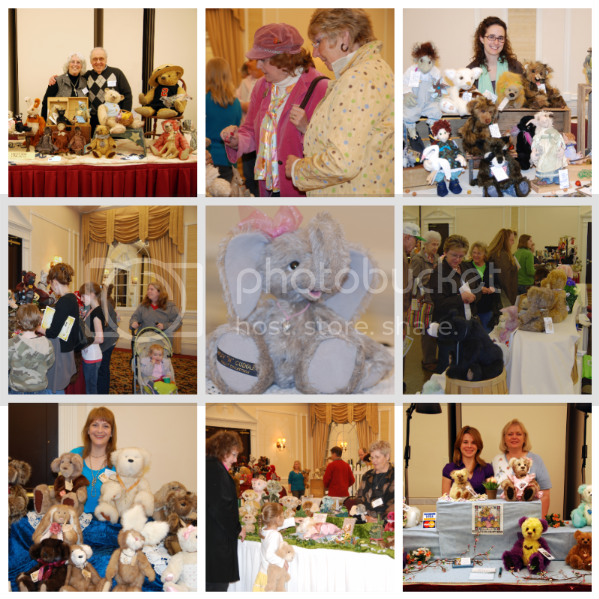 Two weeks ago artists and collectors from across the US and Canada joined together for the first annual New England Teddy Bear Gathering in Nashua, NH, USA. It was a wonderful day and you can now get a taste of the magic and fun we had by reading a review of the show and seeing the many, many photographs that were taken! Ready? Um, I have a blog?? I can't believe it's been 6 months since I've posted here. I'm sorry my friends! I actually sort of knew that might happen. I'm active on Facebook, a couple of bear maker forums and have my website... writing for my blog too just seemed daunting and time consuming. And if you want to keep a little more up to date on the goings on in the Back Road Bears studio I invite you to check out my Facebook Fanpage! Welcome to my little corner of cyberworld! 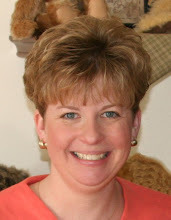 I am an artist, event planner, teacher and collector of all things teddy bear! 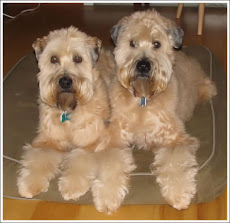 I live on the Back Roads of New Hamsphire with my hubby, Henry and our two Wheaten Terriers, Tucker and Riley. You are likely to find ramblings about my bear making, news about the teddy bear shows I'm planning, pictures of my dogs in all their silliness and other tid-bits that make up life's stuffing! Hopefully you'll find my stories and adventures interesting or at the very least, enjoy the pictures! Riley & Tucker - "The Boys"